Looking for more upcycled t-shirt craft ideas? 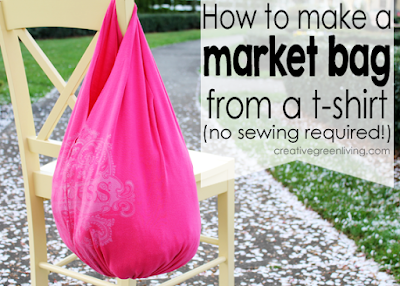 Learn how to turn an old t-shirt into a reusable shopping bag with this tutorial >> Make a market bag from a t-shirt. Begin by using a piece of paper as a pattern. Cut half of a heart on the paper and fold the t-shirt in half. This heart is slightly stretched wide so the full Wonder Woman symbol would be visible. Pin the pattern on the center line of the shirt. Next, use the scissors and cut around the pinned on pattern. T-shirt to pillow step 2: Pin Together! Separate the hearts and put the right sides together. Then pin two pins perpendicular to the edge to show where NOT to sew. Pin around the edges of the heart. T-shirt to pillow step 3: Sew the Heart! Start stitching with a straight stitch. Begin at one of the perpendicular pins and sew around the heart to meet up with the other perpendicular pin. This open part of the heart is where it's stuffed...and it is the easiest place to hand stitch because it is a straight line. Repeat sewing the edge, this time with a zig-zag stitch right on the edge. Then trim the threads. T-shirt to pillow step 4: Turn! Find the opening in the side of the heart and turn the entire pillow right side out. Take extra care to push out the seams all around the heart. T-shirt to pillow step 5: Stuff! Now fill the inside of the heart with lots of stuffing. Push it in all the edges and points. T-shirts stretch and will use more cotton batting than expected. Fill the pillow and add a little extra that you can push around after the hand-stitching. T-shirt to pillow step 6: Hand Stitch! Thread the needle and tie a knot on the end. Pinch in the fabric so it lines up with what has already been sewed. Push the needle into the seam and back through to the other side. It's possible to hide the stitching completely, it's a personal preference. Stitch the entire opening and tie off the other end. This is the perfect throw pillow for a unique bedroom or couch. Get creative and make pillows of all shapes and sizes! What shirt will you turn into a t-shirt? What shape will you make yours? Let me know in the comments!